Kamo Hayrapetyan-Atajanyan tells his father Sargis Atajanyan’s story. He was interviewed in his place in Kapan, in June 2012. We are publishing here the abridged version of his narration. “My father was arrested twice. First it happened in 1930 and then in 1937. He was taken away in 1929, convicted and exiled in 1930, and was back in 1935. We used to live in the village of Geghanush. I do not know the story well enough as I was born after my father’s return from exile in 1935. As my mom and others used to tell, he had been convicted and exiled to Siberia as a nationalist and as an inciter against the Kolkhoz. As far as I know, they didn’t convict him of being Dashnaktsakan at that time. It happened later. He had a watermill and was considered a wealthy man, a Kulak… My mother used to tell that they had arrested him as a Kulak and for having the watermill. He did not want to join the Kolkhoz as he earned his family’s daily bread by running the watermill. They exiled him, and the watermill became the property of the Kolkhoz. I still remember the watermill which existed up to 1952. I even worked there at an early age. It belonged to Kolkhoz. In exile my father didn’t have the right to free movement. He didn’t have a passport but only a certificate which I have kept so far. Picture 44.2, Sargis Atajanyan’s movement restricting document. After my father was exiled, all his family members were deprived of voice. He came back in 1935. He was already deprived of any property and was not a Kolkhoz member. The living became hard. They allowed him to live and work in Ghapan and I still keep his work permit. In those years, there was an Artel of utility services in Ghapan where he worked two years. He was a worker in a small brigade. I still have that paper with the brigade members’ list. The list was made in January 17, 1937. He could not believe it would happen one day… but eventually it happened. It was in 1937, when they arrested him for the second time. They captured him in a remote forest disposed in 18-20 km from here. It was in summer, and he had taken the cattle to the grassland with my mom. My mother would tell how at night the dog started to bark. My father said, “Mashinka, they have come to take me, get up ….” He had been extremely tired that day, and could not even wash properly as there was no water. Before going to bed, they had put a large stone against the door from inside. When they arrived, they pushed the door inside and smashed it. They said, “Sako, have you made this trap for us?” They tied my father’s hands behind his back, and made him walk behind their horses 18-20 km at night. They went to Ghapan. The next day, when my mother went to find out something about him, they told her that he had been taken to Goris. Nevertheless, they kept him there for five days. Later, we heard different rumors. Once a Turk came and informed us that he was in Arkhangelsk. We used to get different rumors from different people. I had been applying for information about my father for many times but could not get any answer. Once they finally responded informing that my father had died in 1942. They just wanted to make me believe that my father had been killed in the war. However, later when we got the rehabilitation certificate, they told us that my father was executed on November 14, 1937. His second arrest ended with his execution in Yerevan. I firmly believe that they axed him. I think so because some of my friends have told me that they had seen blood stains on the ground after the carts carrying out the corpses from the KGB building moved away. Besides, no shots had ever been heard by anybody. They probably did not shoot so that the cellmates did not hear it. They axed the people when they were asleep not to make a noise. I am sure that my father was axed in the same way. We received my father’s acquittal paper in 1959. Many rumors circulated in the village at that time. Once I learnt that there was a connection between my father’s arrest and Gerasim’s case, and that he was executed as Dashnaktsakan. It was rumored that my father had been Gerasim’s victim. Gerasim was a powerful personality, and Nzhdeh trusted him for some reasons. Not everyone could be trustworthy, and Nzhdeh knew well who deserved trust. Gerasim had fought against the Turks for long that is why the Turks wanted to harm him and his family. So, it was my grandfather’s turn. He was a miller. The Turks came and cut the water of his watermill… It was probably 1918 or 1920. When they cut the water, my grandfather guessed that the Turks had done it. He put a large millstone behind the door so that they could not enter. Nevertheless, the Turks somehow entered through the roof and slaughtered him … They slaughtered our grandfather, my father’s father. Gerasim had to revenge, and he did it. Here his tragedy started. He hid in the woods and later was persecuted as a bandit, but in reality, he was not a bandit. He would come to the village at night and would return to the forest at daytime. Those were the forests where my grandfather’s and later my father’s watermill was. It was the territory above our village Geghanush … Gerasim’s mom would go to the watermill to my father, take the pack of bread, cheese, garlic and onion and would go to the forest as if to gather wood in the place called Ghushin Qar. There her son would be waiting for her. Once the Bolsheviks persuaded Gerasim to surrender and promised not to harm him. They went to Gerasim’s house in Geghanush… Gerasim went to them willingly… he trusted them. He was sure that Nzhdeh’s reputation would protect him. They interpreted these words as if my father had persuaded the villagers and farmers to stay far from Kolkhoz, and the informants had been from our village. It was the time of betrayals. A friend could betray his friend, and a brother could betray his brother. Twenty-six people were deprived of voice in the village in the consequence of betrayals. Actually, there was nothing written in my father’s acquittal paper. Even the accusation was not mentioned there. It only said that the case was closed for the lack of Corpus Delicti. Picture 44.5, Sargis Atajanyan’s case was dismissed for the lack of Corpus Delicti. However, the accusation is not mentioned there. 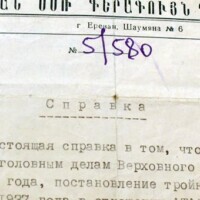 Later, I received a new document according to which my father was rehabilitated. The Rehabilitation Paper allowed us to receive a sum equal to his two months’ salary at his former job. I got some 60 or 80 rubles and bought a freezer. The life of all our entire family was full of harassments, and I should say it continues up to now. For instance, when they came to arrest my father for the second time, they advised my mom to change my family name because all Atajanyans were to face hard times ever after. The name related to the name of Nzhdeh and Dashnaktsakans. Consequently, my mom changed my name into Hayrapetyan. Hayrapet was my grandfather’s name, the one whom the Turks slaughtered in the mill. His death devastated me. Later, they labeled me “Enemy of the People”. Even in 1990, they would call me “Traitor of the Nation” and Dashnak. The word Dashnaktsakan had a negative meaning. ARF was facing hardships then1. When they took my father in 1937, my mother had to take care of her three children on her own. People persistently persuaded her to marry a shepherd from our village Gurgen Zakarian whose wife had died and had left eight orphans. My mother stood firm against it, and she suffered a lot. Since she had been a Dashnak’s wife, it was very difficult for her to get a job. She could not afford taking care of us. She had no option. She finally got married to be able to take care of her children though she was eager to wait for her husband back from Siberia. The order of the period required to be silent. Where there is a talker, there should be a silent keeper. I know he could not do it, he could not keep silence; he had to express his concerns because the nation was in danger. In 1937, only from our village they executed sixteen people and exiled forty-two. Among the executed in 1937 six were Atajanyans… When I was the head of our Kolkhoz 2 men arrived from Central Asia. One of them was Sanatruk, and the second’s name was probably Tovmas. 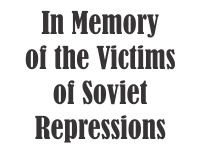 They had been the victims of the Soviet era, who had survived escaping to Central Asia…. They had abandoned their families, and later, when it calmed down, and the situation in the country was regulated, they returned to their families. My father also could do it, but he was concerned about his children, he did not want to leave us alone. He could never believe that one day he would appear in such a situation. He was sure he had not done anything wrong. It was a chaotic and a hard period. That villager had never been out of the village up to that day. He was a great gardener and land cultivator. He also could make fantastic healing remedies against any disease. When the children passed near his garden, he would call them and give a cucumber or a plum. After Harutyunyan’s arrival, they came and took him away. He never showed up again. His name was Shahri. The enemy was among us. That very Harutyunyan was an informant. He worked in the party. He lived a long life in Yerevan, and nobody ever condemned him. Nevertheless, many people used to say that he had ruined their families. He was from our village. After Stalin’s death, in the period of Khrushchev and Malenkov, some truth was revealed, but in fact, up to 90s people were afraid to speak. To forgive or to condemn? – I treat all the issues with Christian approach. It is forgiveness. You should forgive to win. Victories very often are gained through forgiveness. If I raised my hand and made revenge the same would happen again and again. … Justice is a very small weapon against injustice. There has never been justice, and there won’t ever be justice. There is no triumph for Justice. I have seen a lot of injustice in my life and have been one of its victims. I lived in the orphanage, and I wanted to pay back for all the good I was given and for they fed and taught me. Whatever I did in my life I tried to please the people, so that not to be blamed, not to be changed or not to change my party and ideas. Nevertheless, it did not help… I have read that when people grow up they stop getting surprised. …The border between the justice and injustice is very fragile…. They are too close and you can hardly tell one from the other. But, in all cases, no matter how rebellious you are, you shouldn’t be too emotional. Being rebellious is good but not at the expense of your life.